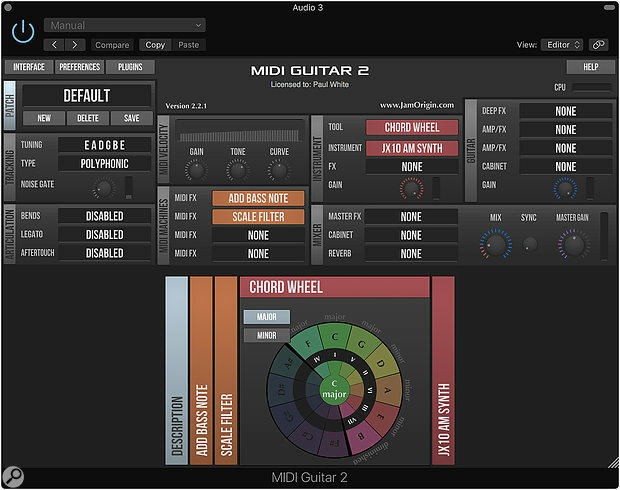 The stand-alone version of MIDI Guitar 2 includes an enhanced range of bundled instrument plug-ins, as well as a selection of MIDI Machines. Are the days of hex pickups numbered? Now available as a Mac/Win plug-in or stand-alone, Jam Origin’s guitar-to-MIDI utility is fast, versatile and affordable. The original version of Jam Origin’s MIDI Guitar software gained a glowing review from Bob Thomas in SOS May 2014 (www.soundonsound.com/reviews/jam-origin-midi-guitar). So much so that, on seeing that v2 had been launched, I went straight to the Apple Store and bought — yes, you read that right! — a copy for myself. And, as a guitar player who is totally rubbish at keyboards, I have to say that it is one of the most impressive pieces of software that I have ever used. The original MIDI Guitar ran as a stand-alone program, intercepting audio from a designated input on an audio interface and then converting it to MIDI to be passed on to the MIDI input of the DAW. Now available for Mac and Windows, version 2.2.1 offers even more functionality, but at its heart is still the seemingly impossible trick of turning the output from a standard guitar pickup into polyphonic MIDI. This it does so reliably and quickly that I now use it in preference to any of my hex pickup MIDI guitar systems. Systems that can handle monophonic conversion are old news, but MIDI Guitar really can separate out the notes from chords and rapid arpeggios at lightning speed. According to the designer, it uses deep-learning/AI technologies employed in speech recognition and other ‘learning’ applications, rather than traditional DSP techniques, and he feels that we are just on the verge of seeing what this technology can do in the pro-audio field. Version 2.2.1 is available directly from the Jam Origin web site, and can be authorised to multiple machines. The latest version is bundled with MIDI Bass, which is similar in concept but monophonic, and can also host third-party AU or VST plug-ins. One big difference from the original, however, is that MIDI Guitar 2 now comes in a plug-in version of its own, offering the best of both worlds whether you are recording or playing live. For DAW users, I really would recommend this full package, but note that an earlier version of MIDI Guitar 2, seemingly aimed at GarageBand users, is still available on iTunes and saves you a little on cost if you don’t need MIDI Bass or the plug-in version. 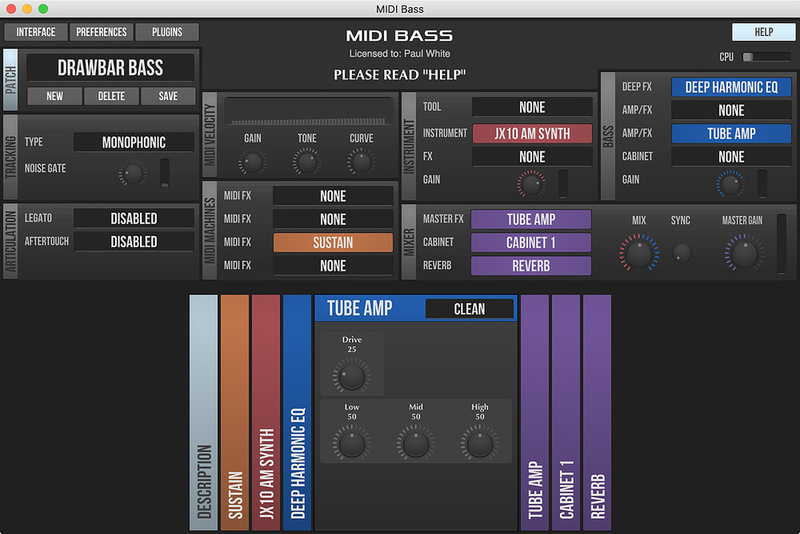 MIDI Guitar is available in VST and AU plug-in formats, but there is not yet an AAX version. An online guide to using MIDI Guitar 2 with many of the popular DAWs is available from the Jam Origin web site. In Logic Pro, which I use for nearly everything, both the stand-alone version and the plug-in version worked perfectly, generating MIDI data that you can edit in the Piano Roll in the usual way. Jam Origin say the plug-in version is preferable for minimum latency as the stand-alone version can add 3 to 6 ms of latency. Since MIDI generated by the plug-in is automatically routed to Logic’s active instrument track, you can use it to play Logic’s own plug-ins as well as any third-party instruments that appear in your plug-in folder. The plug-in version opens in an audio track insert point, so the audio input feeds both a chain of amp/speaker and effects modelling and the MIDI conversion engine, allowing you to play one of MIDI Guitar’s onboard synths or any other plug-in instrument you have on your system. You can come up with some unique tonal combinations by mixing the processed guitar sound and a synth sound. The MIDI Guitar plug-in can itself host instrument plug-ins to provide a real-time synth output, as can the stand-alone version, but if you want to record editable MIDI, it is usually best to set up a separate DAW track for the virtual instrument you wish to control. As long as that instrument track is selected, it will receive MIDI from the MIDI Guitar plug-in. You can, of course, also use the plug-in to process any previously recorded clean guitar parts into MIDI, though any recorded reverb, delay, modulation or distortion is likely to compromise the translation process. This seems to be the cleanest approach for working with synth sounds with a fast attack: record your guitar part as normal, insert MIDI Guitar 2, then create a new instrument track to record the MIDI data. For sounds with slower attacks you might prefer to hear the synth sounds as you play, in which case you can have the synth track active and recording as you play the guitar. To hear a guitar through the plug-in, something must be selected in the Amp/FX slot: Direct is the option to choose if you want to hear an unprocessed sound. Other options include adding various amp/cab simulations that add overdrive, reverb and delay. The overdriven amp sounds might not rival some of the dedicated amp emulation plug-ins for authenticity, but they do sound good mixed with the synth sounds and there’s a lot of ‘tweakability’, including the ability to import your own cab and reverb impulse responses. If you find that you can create a processed guitar sound using MIDI Guitar 2 that you can’t recreate using your usual guitar amp/effects plug-ins, you can bus the processed audio to a new track and record it. If not you may as well leave the guitar output switched off. For live use, setups saved in the stand-alone version can be recalled over MIDI, and parameters within the program can also be assigned to MIDI controllers. Stored patches include any third party hosted inside MIDI Guitar. Significant changes have been made to the user interface since version 1, and the current version is also different in layout from earlier versions of MIDI Guitar 2. There are more sections and greater use of colour, though mouse-over prompts and a built-in help file make operation very straightforward. MIDI Guitar 2 is now also available as a VST or AU plug-in, in which capacity it can still host other plug-ins. The active MIDI and guitar audio sections are depicted by vertical coloured bars in the lower half of the window. Clicking on these will open them to show the controls and, where applicable, a range of presets. The Mix control in the Mixer section acts as a guitar/synth balance control with a master volume control to its right. There’s also a choice of how the note detection is displayed, with options to see the notes light up on a keyboard, a MIDI Monitor or a chord wheel. The same menu gives you a view of the output waveform and access to a guitar tuner. This includes non-standard tunings, though all are referenced to A=440Hz. In version 1, the next step was to set the Sensitivity control; in v2, this has been replaced by a noise gate that basically does the same job, setting the threshold below which MIDI conversion is not triggered. The optimum setting depends on how hard and how cleanly you play, and also on your interface gain setting. If you have the interface gain set fairly high in the stand-alone version, you may find that you need to dial in quite a high gate setting for clean triggering, so if the little yellow warning triangle comes on telling you that your threshold is a bit on the high side, it’s perfectly OK to ignore it! In practice, I found the best way to set the gate threshold was to keep it as low as possible but not so low as to allow notes to retrigger when I lifted my fingers from the strings. So what’s new? Well, when I first came across MIDI Guitar, the only onboard synth was a version of the MDA Piano plug-in. Now, you get a more editable version of the MDA Piano plus the MDA Electric Piano, the JX10 AM synth and the DX10 FM synth. As previously mentioned, it can also host third-party AU and VST plug-in instruments from this menu once they have been scanned by the system. New, too, are numerous MIDI Machines: in effect, MIDI plug-ins that process the data on its way into the DAW, allowing you to transpose, set up arpeggiators, add bass notes, add vibrato, add sustain, add an auto harmony in the key of your choice, change the playing dynamics and so on. Many of these functions will have counterparts in mainstream DAWs, but having them on board makes it possible to use the stand-alone MIDI Guitar 2 for live performance without needing to run a DAW at all. For controlling playing dynamics, three rotary controls add MIDI Gain (velocity), MIDI Tone (tilts the high-to-low note sensitivity in either direction) or Curve, which sets the MIDI dynamic range, with the note level becoming more constant as you turn the control clockwise. You can also call up numerous Legato modes with various times of added sustain, plus an infinite sustain option. MIDI pitch-bend can be set to 1, 2, 4, 6 or 12 semitones to match your needs and those of the synth you are controlling, or switched off if you want authentic piano or organ sounds. There’s also a choice of monophonic or polyphonic pitch tracking, the former being useful when recording those fat bass synth lines using a standard guitar. To play virtual instruments with minimal latency, you should set the DAW buffer size to 128 or below when working at 44.1 or 48 kHz. In most cases the delay will be imperceptible unless you have other plug-ins running on other tracks or busses that are introducing extra delay. (Logic users can hit the Low Latency button to temporarily bypass any high-latency plug-ins while recording.) In practical terms, I never felt the response to be sluggish, and once you get the trigger threshold set up for your playing style, the reliability of tracking both on single notes and chords is uncanny. If your playing gets messy from time to time, you can usually spot the resulting rogue notes in your DAW’s piano roll editor (they typically have very short duration and low velocity) and delete them. As with all such systems, MIDI Guitar is the most forgiving of messy playing if you use sounds that have a slower attack, but as long as you play cleanly, even piano parts translate perfectly well, and the software is capable of tracking even very fast playing. If you work on previously recorded guitar parts, rather than playing live, you also have the opportunity to fix any level discrepancies and rogue noises in the performance before putting the plug-in to work. You can also set larger buffer sizes without worrying about latency. If you want to record the processed guitar sound, with or without some synth sound mixed in, it can be sent to a bus and then on to a new audio track. A word here for Logic and GarageBand users, though: as long as the plug-in is running, MIDI will be sent to whichever instrument track is currently selected, just as though you were playing a keyboard. Muting the guitar track with the MIDI Guitar plug-in inserted won’t stop this, though muting the guitar region will. Once you’ve recorded a MIDI part that you’re using with a third-party instrument on another track, it’s probably safest to disable the MIDI Guitar plug-in, as otherwise, if you select a different instrument track to work on, you’ll find that it starts doubling the guitar part. This shouldn’t be an issue with other DAWs. 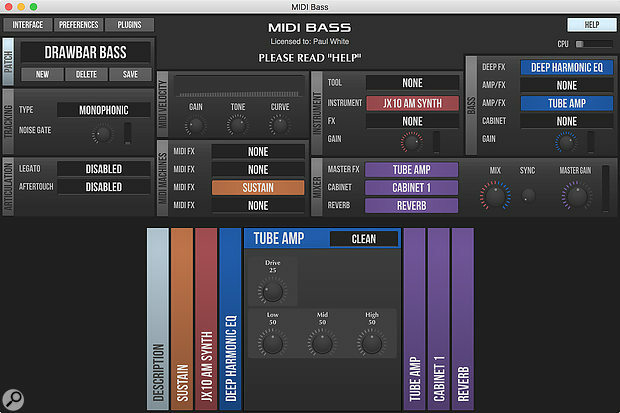 Bundled with MIDI Guitar 2 is MIDI Bass, which is optimised for monophonic, low-frequency operation. MIDI Bass, which comes as a separate application and plug-in, is monophonic but has a very fast response. In essence it has the same feature set as the guitar version, except where that relates to polyphony. You could get the same results using a standard guitar and MIDI Guitar 2, but if you prefer to play bass parts from a bass guitar, this does a very tidy job. I find it difficult to overstate what the designers of this software have achieved. Had I not tried it for myself, I would simply not have believed it possible! As a guitar player, I think MIDI Guitar 2 is the most significant piece of software that I have come across next to my DAW of choice, and I use it now on virtually every session where I need to control virtual instruments. Most hex-pickup hardware solutions don’t really feel natural to me; with MIDI Guitar, I still feel as though I am playing the guitar, but I hear synth sounds. This is all the more remarkable as MIDI Guitar costs less than a typical hex pickup (and that’s before you add the cost of the hardware to plug such a pickup into). If you still need to be convinced, you can download it for free and it will work in demo mode, but will force you to stop and dismiss a window every few minutes. Version 1 was impressive but this current version is a significant step forward. The only real alternatives I’ve seen require a hex pickup to be fitted to the guitar; of these, the Fishman system has probably the fastest response. After using MIDI Guitar 2 and getting a glimpse of where this technology is going, I can’t think of a reason to prefer hex pickups. Tracks natural playing using a standard guitar pickup as the sound source. Very accurate when processing polyphonic performances, even when the playing is quite fast. Stand-alone and plug-in versions to suit both live performance and DAW recording. No AAX version available yet. MIDI Guitar 2 is more than technology: it is clearly magic! £82.91 (UK price reflects US exchange rate).